This page summarizes the changes made in INVEST Version 1.0 to create Version 1.1. The edits to the criteria (within the SP, PD, and OM modules) included minor formatting, editorial, and content changes that do not affect scoring. The formatting changes included inserted scoring requirement numbers and associated table numbers for better alignment between requirements and the web tool scoring questions. The editorial changes included grammatical corrections, modifications to word choice, and correction of typos; the content changes include clarifications, definitions, and added or updated links and references. Figure 1, Matrix of INVEST Version 1.1 Criteria Changes, is a matrix that references each of the criteria and identifies the type of edits made. It is downloadable below. If a content change was made, a brief description of that change is included. Select the link below to view Figure 1. 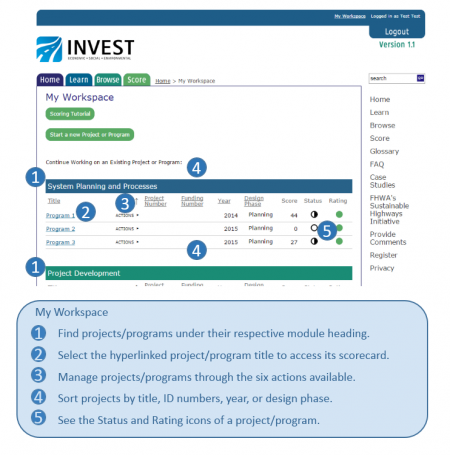 The Version 1.1 Compendium are available for download under RESOURCES in the INVEST Library. 1. The Program/Project Registration Fields (Accessed through the "Start a new Project or Program" button on the My Workspace page) have been modified and/or added to. Project/Program Title replaced "Project Title"
Project/Program Owner replaced "Project Owner"
Other Project/Program Information replaced "Other Location Information"
2. The My Workspace Page has a new look, shown in Figure 2 and summarized in A through C below. A. As mentioned in #1, the My Workspace page is now sortable by title, primary and secondary ID, Year, and Design Phase. These are fields that are entered during the program/project registration. B. The My Workspace actions are now icons that appear when the user hovers their cursor over the actions arrow. This provides a cleaner workspace and prevents the actions from obstructing the project title. The following actions are available on the My Workspace page: edit, duplicate, print, score, delete, or invite others to collaborate. These are accessed by hovering over the "Action" word and arrow to the right of the program or project title and then selecting the desired action from the icons that popup. By hovering the cursor over the icons, a label identifying the icon will emerge, as in Figure 3. C. The My Workspace page now displays status and rating of each program or project the user owns or collaborates on. 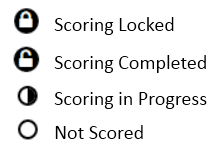 The status icon indicates if a project has not yet been scored (on open circle), is in the process of being scored (a half-filled circle), or completed scored (a filled circle). The Rating icon indicates by color the current rating of the project (bronze, silver, gold, and platinum). Green indicates no rating. Figure 4 shows the Status and Rating Icons. 3. 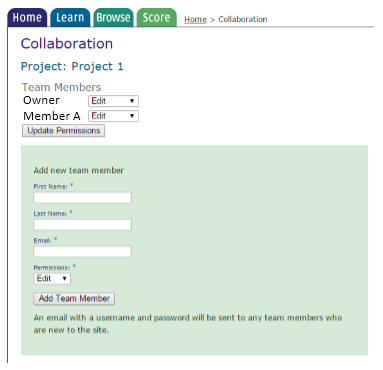 The program/project owner can now better manage collaborators. The owner may now set, view, or edit permissions for any collaborator and can also remove a collaborator. The Collaboration dialog is accessed through the Actions icon on the My Workspace page. See Figure 5. 4. An e-mail that will notify a user when he/she has been added to a new program/project (as a collaborator). The e-mail will state who added the user to the project and the name of the project. A new e-mail will be sent to the user for each program/project the user is added. 5. Status icons on the Scorecard page were added. The status icons strive to help users in tracking the scoring progress on a project. This is especially useful if collaborating (scoring a program or project with multiple users) or for identifying that a criterion has been completely scored, even if it has not received maximum points. 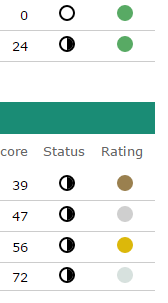 The status icons are located on the Scorecard page, to the left of the criterion number and title. The status icons are identified in Figure 6. The icons are labeled when the cursor hovers over the icon. The criterion will be labeled as "Scoring in Progress" if at least one question is answered. Once all questions are answered, the criterion will be labeled as "Scoring Completed." The criterion can only be locked if all questions are answered. Each criterion can be locked or unlocked for editing by clicking on the icon; it is just intended to be an inventory on status. However, for programs/projects with collaborators, only program/project "owners" can lock or unlock the criteria, or otherwise change their status. 6. The steps to customize a scorecard are now more intuitive and descriptive. After selecting "Custom Scorecard" on the program/project registration page, the user can check additional criteria to add to the custom scorecard (if desired, in addition to the 19 required in Version 1.1 (changed to 11 in Version 1.2)).